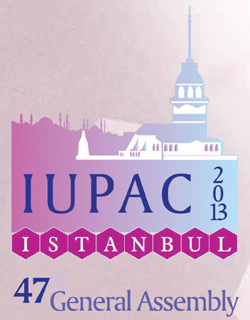 The 44th IUPAC World Chemistry Congress, to be held 11–16 August 2013 in Istanbul, Turkey, will have as its theme “Clean Energy Through Chemistry.” To encourage young chemists to participate in this unique congress, the organizers have established two different programs, both offering travel assistance. The first program is especially targeted to young scientists from developing and economically disadvantaged countries; the second is open to chemists from any country. Awards of up to USD 1500 will be made available to qualified candidates as a contribution to the cost of their travel to attend the Congress and to meet Congress registration fees. Applications from candidates under age 40 are welcomed. Scientists from academia, government, or industry may submit applications directly to the address below. Those successful will be expected to submit an abstract of a poster or paper to be presented at the Congress. Such abstracts will be subject to adjudication as will all other submissions for presentation at the meeting. The deadline for receipt of applications is 31 March 2013. Applications should be sent to Tahsin Kizilay <taum74@gmail.com>. Concurrent with the Young Chemists initiative, IUPAC and individual National Adhering Organizations (NAOs) are offering a Young Observer program to provide young scientists with the opportunity to participate in sessions of the IUPAC General Assembly. Such sessions are generally reserved to IUPAC members of specific divisions and committees, but Young Observers can participate in these meetings—a unique opportunity to learn about IUPAC activities, establish international collaborations, and gain knowledge of global research activities. Page last modified 25 October 2012.